To make the game more amusing the designers added the sound effects. You may choose a male or female player, being either a child or a grown-up. Moreover, you may use your voice in the game as well as the voices of your friends having previously recorded it in the wav. format. "None" - the game is set to mute mode. "Sound" - each movement of the cards is followed by the voice commentary. "Voice" - during the game the computer speaks in the voice of the player. 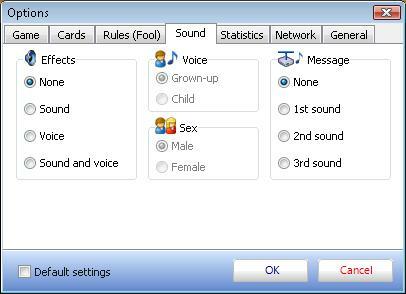 "Sound and voice" - movements of the cards are followed by the voice commentary and the computer speaks in the voice of the player in the course of the game. 1. Go to "Game"- > "Options". 3. Set the needed sound. 1. Record your voice in the wav. format. 2. Save it under the same name which you want to change in the “voice” option. The files beginning with m_.., for instance, “m_otboy” stand for male voices. The files starting with w_.. denote a female voice, with g_.. stand for the voice of a girl, with b_.. – of a boy.